The first and most important step is selecting your video. Here you can choose any video that you’ve uploaded to YouTube. Next you can include a few words to describe why viewers should watch your ad. This is a great way to catch your audience’s attention, so make it snappy! We recommend a daily budget for your campaign, or you can choose your own. Remember, you may spend less than what you’ve budgeted in a given day, but you’ll never spend more. Who would you like your video to reach? This step is optional, and remember: since you only pay when viewers choose to watch your video, TrueView ads have natural self-selection targeting built in. Take comfort in the peace of mind that you only show your ad to people who want to watch it. 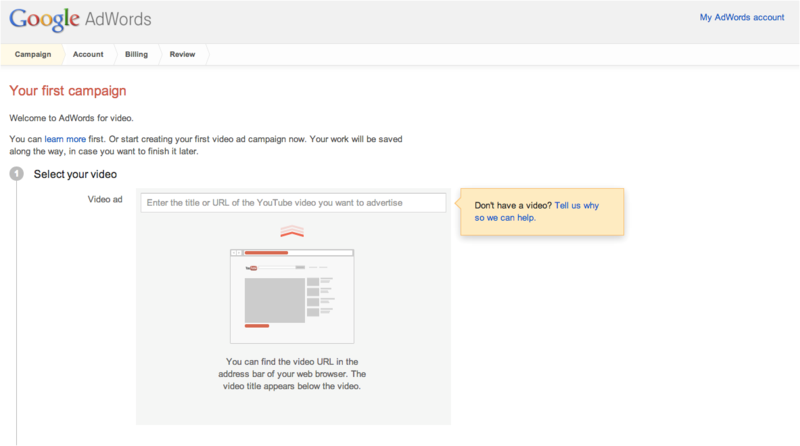 And boom, you’ve now set up your first video ad campaign using AdWords for video! Now all you’ll need to do is sign-in with a Google account or set up a new one, and your ads will be running shortly. Head over to AdWords for video to try it out today. At Google, we believe that video is such a powerful way to build your brand that everyone should use it. That’s why we’re excited to announce a simplified way to set up your first campaign in AdWords for video. Our new campaign creation flow eliminates the clutter by focusing on the key pieces of your first video ad campaign: your video, your thumbnail copy, your budget and your target audience.